Holly Wales and Kate Forrester both taken from Stereohype's design competition winners, Holly T Burrows from B.I.O. (By Invitation Only) Series 11, Kerstin Hlava-Landeck from B.I.O. Series 5, Hello Nekko from B.I.O. Series 7, Michael C. Place from B.I.O. Series 1 and Judith Egger from B.I.O. Series 2. 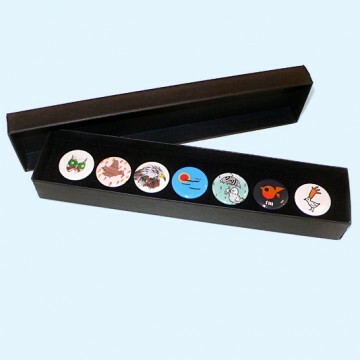 Single badge SKUs: B0179C05, B0047C04, B0638B11, B0251B5, B0397B7, B0035B1, B0079B2.